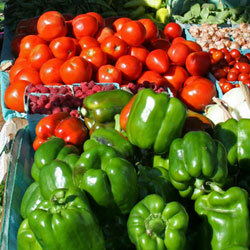 Farmers markets are a staple of summer and fall in many places. You can deal directly with the farmer, which means you probably get food that is fresher and often less expensive than you could buy at the store. But it also can be a little overwhelming. So here are some suggestions for navigating a farmers market. Have a plan. Just like when you go to the grocery store, it helps to have a list of items you want to look for. Be willing to experiment. On the other hand, be open to trying something new. One of the great things about a farmers market is that you might see produce you don’t often see – or at least you don’t often see so fresh. Talk to the farmer. If you are not sure exactly what an item is or if you are looking for suggestions on how to prepare it, ask. You also should ask if you are concerned about how an item was grown. For example, if it is labeled as organic, you should ask the farmer about the organic process used in growing, since the definition of “organic” can differ. Walk through the market before you buy. You might find better-looking produce or a better price at a different stall. Know what’s native and in season. Apples, for example, are usually picked in the fall. So the local apples you see in a farmers market in June probably were picked months ago. That doesn’t make them unhealthy, of course. It just doesn’t make them super-fresh. Similarly, fruits and vegetables that are not grown where you live probably have been shipped in from far away, just as they are in the supermarket. Come early. That way you get the freshest produce and the best selection. Or come late. Often farmers are willing to reduce prices toward the end of the market so that they don’t have to pack up their things and take them back. Of course, the selection might be more limited. Bring cash. Many vendors don’t take credit. And bring lots of $1 bills, in case a vendor can’t make change for a twenty. Bring bags. While some vendors provide plastic bags, others do not, so bring some of your own. You also might want to bring a large bag – or even a wagon – to haul home your bounty. Have fun. Talk to other market-goers. Sample a scone. If you come with your children or grandchildren, talk to them about how things are grown. Winter can be long, so take time to enjoy this hallmark of summer and fall.